The 55 Nomad project got under way in October of 1995 with a road trip to Pennsylvania to purchase the rusted hulk. In November that year it was moved into the garage where it was destined to stay until summer of 2000 when it went off for paint. While the body was at paint, the engine and transmission were overhauled. Then in August of 2001 the body was back from paint and re-assembly officially began. ON THE ROAD! May 26 2007 was the day we had been working towards for 12 years, road legal and made our first cruise. We put a little over 500 miles on that 1st summer then back to the garage for the winter where repairs and improvements were made. Then in July of 2008, The past 13 years work as lead to this journey, 800 miles to West Virginia for the Chevy Nomad Association Convention where we received 3rd in class for 1955 Modified out of 17 beautiful Nomads in our class. 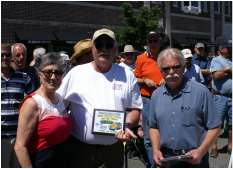 Since that time we have received our share of hardware, including Best in Class 6 years running at the local Hyannis Father's Day car show. But the best was receiving the plaque from none other then drag racing legend Shirley Muldowney and Wayne Carini for TV's Chasing Classic cars. Check out the albums below for details of all the work. Getting Started - November 12 1995 it all begin when the Nomad was moved into the garage where it was worked for the next 13 winters. The body was stripped of everything, then it was removed from the frame. Body Work - After getting the body stripped of anything and everything, it was time to get busy. Out came the cutting tools, the grinders and the welder, it was not a time for the weak of heart. Frame & Suspension - After several winters of nothing but rust repair, the body work was set aside and the frame received all of the attention. Engine - The engine (350 4 bolt main) and transmission (350 TH) are out of a 1976 Chevy van. The injection system is an Edelbrock EFI system. Reassembly - Back from the paint shop with a shiny coat of Tornado Red, the body was set down onto the rebuilt frame and reassembly officially began. Interior - Kept the interior basically stock in appearance but with a newer look. Finally Done - Thirteen years of hard work and an ear to ear grin is what we have to show for it. Doesn't get much better; well a few 1st in show plaques didn’t hurt either.